The second of the six children and born in 1975 December 26, in Gampola Sri Lanka. 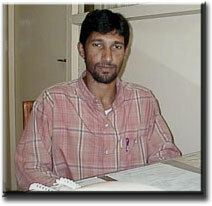 Studied in Gampola Zahira Collage and entered Faculty of Science University of Peradeniya in 1997. Did maths special and graduated in 2001. Became a lecturer in the department of Engineering Mathematics, Faculty of Engineering University of Peradeniya in 2002. Got married in 2004 and traveled to Kansas State University(USA) for graduate studies. Currently busy with entertaining three kinds(Abdul Rahman, Abdul Azeez, and Abdul Malik), teaching mathematics and thinking of abelian heights. Ph.D, Kansas State University 2009. Mahler measures of polynomials, Heights of algebraic numbers, Number fields, Number theory (algebraic and analytic), Analysis (real and complex), Algebra.